The objective of our Corporate Foresight Benchmarking Survey 2008 was to establish the state of corporate foresight systems in large multinational organizations. We collected date from 77 leading multinational organizations. Strong capabilities for collecting and interpreting information are in place. However, insights from Strategic Foresight activities are not disseminated and used efficiently. There remains to be a strong emphasis on scanning the technological and economic environment. However, companies still lack foresight capabilities for detecting changes in customer needs as well as emerging regulatory and legislative issues. Concerning information sources, the companies, to a large extent, still rely on openly accessible sources such as magazines or the Internet. Top performers have built capabilities to access restricted sources, such as personal networks or specific databases that offer them a competitive advantage. Concerning methods for information interpretation and identification of appropriate actions, companies continue to rely on a limited set of methods that have been employed in the past. It is advisable to build a more diverse method portfolio and select methods deliberately according to the context and problem at hand. Only top performers actively encourage their employees to develop personal networks. Scanning processes are still most frequently initiated by top management. In addition, a bottom-up process should be build in which employees can bring emerging issues to top management attention. 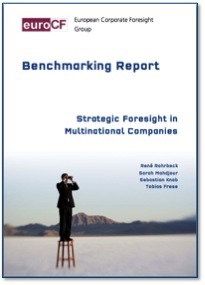 Rohrbeck, R., Mahdjour, S., Knab, S. and T. Freese (2009) Benchmarking Report: Strategic Foresight in Multinational Companies, European Corporate Foresight Group, Technische Universität Berlin.